Remember my sailor friend from the Cake Batter Chocolate Chip Cookies post? Well, he shipped out yesterday. I have always been an emotional eater, but this was full-on using my hand as a spoon to get Nutella out of the jar and into my mouth. I decided that was probably not going to help my weight loss goals for the year, so I quickly transfered my energy into baking cookies which I promised myself I’d give away and not eat. I even threw in my box of Reese’s Pieces, knewing they would only tempt me if left in the fridge. 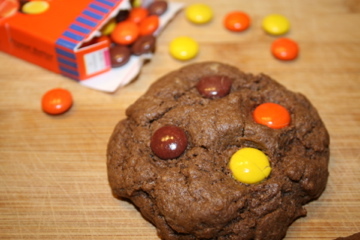 Next time I try making these, I’m going to put Reese’s Pieces in the dough itself, instead of just on top of the cookies. 2. Mix together flour, baking soda, salt and cocoa powder. 3. Add in butter, sugars, egg, milk and vanilla. 4. Gently mix in peanut butter until well incorporated. 5. Generously scoop balls of dough onto a parchment paper-lined cookie sheet. 6. 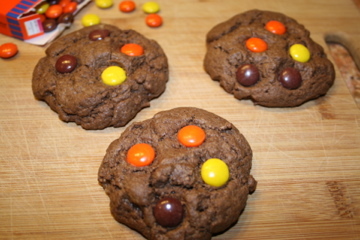 Press Reese’s Pieces onto the top of each dough ball.